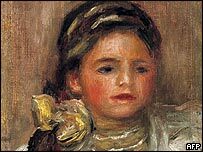 A painting by Pierre-Auguste Renoir has been stolen from a Paris auction house shortly before it was due to be sold. The painting, called Tete de Fillette (Young Girl's Head), is estimated to be worth 200,000 euros (£138,000). The Tajan auction house reported it missing on Tuesday, but were not sure when it was taken, police said. There were no signs of a break-in. The oil-on-canvas painting, which belonged to a lawyer, was due to go under the hammer on Thursday.